The Dashboard is the central place where you manage and oversee your projects. With it, you can get a quick view into the status of your translation projects and what remains to be done. Depending on how you organize your projects and what you're trying to figure out, you can see summary information either for all the projects in your organization, or just the data for a specific project. To see summary information, click All projects in the project navigation. To see data for a specific project, click on the project's name in the project navigation. The information in the right panel will automatically change to reflect your selection. 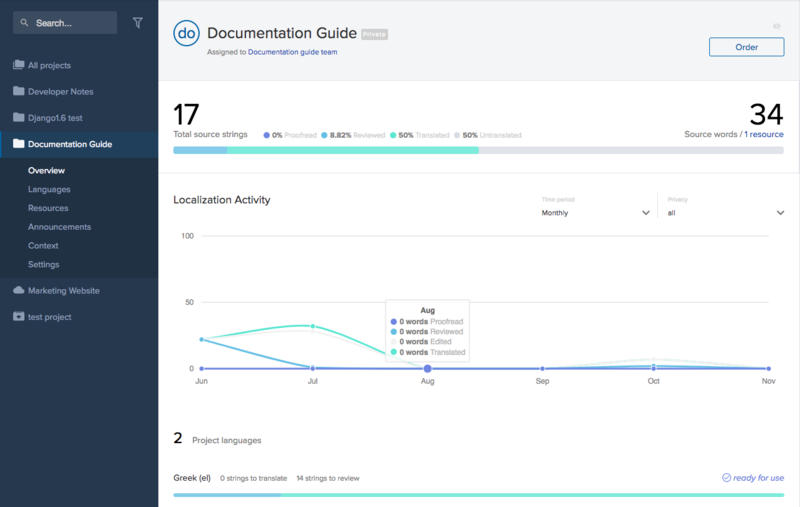 Translation progress bar – Right under the project name, you'll see a progress bar showing you the overall translation progress of all the resources in the project. Specifically, you'll see the percentage of untranslated strings, translated strings, reviewed strings (1st review), and proofread strings (2nd review, if enabled). 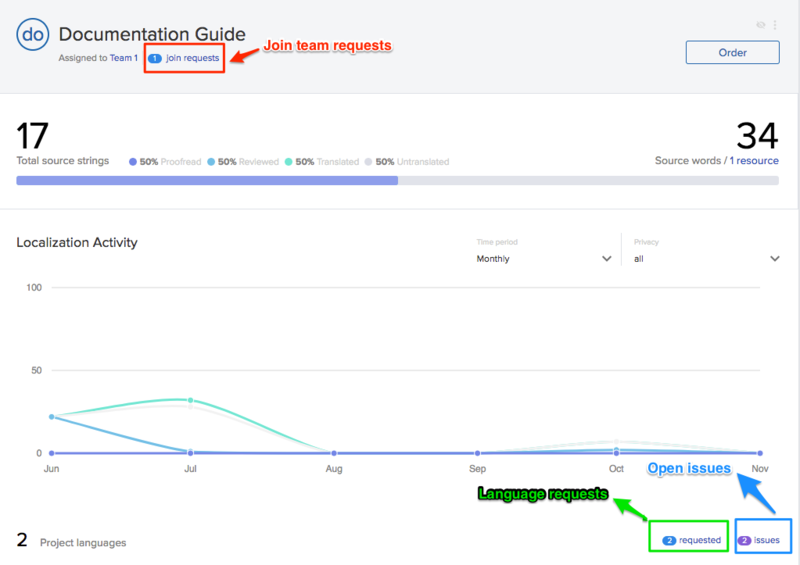 Join requests – If you're crowdsourcing translations for your project (only public projects can receive join team requests), you can see how many people have requested to join the team that's assigned to the selected project. Click on the link to manage any join requests you may have. Project languages requested – When you're crowdsourcing, translators from your community can request that the project be translated to more languages. Click on this link to see and review any incoming project language requests. Open issues – Issues are things that need to be addressed. It could be an error with a source string, or question from a translator. Clicking on the issues counter brings you into the editor, where you can resolve them. Strings to translate – The progress bars at the bottom of the page show you the translation progress for each of your project's languages. If a language has been 100% translated, it'll be marked "Ready for use." Otherwise, you'll see how many strings still need to be translated. If you're interested in seeing progress for a specific resource file, go to Resources and you'll see the percentage of completion for that particular resource. The timestamps in the dashboard show the user's local time. Join requests, project language requests, and open issues are not available in the All projects view.